What is a water flux system? How does a water flux system work? What are the different components of a water flux system? How do water flux systems differ from each other? How do you select the water flux system that is right for your application? A water flux system is an integrated system of components used to measure, record, and process the water (H2O) exchange between the biosphere and atmosphere in the surface layer of the atmosphere. These systems are used over different land types (such as forests, grasslands, crops, and shrubs) across the globe to provide information needed for management and research purposes. Water flux systems that offer a rugged design, low power requirement, low maintenance, and network monitoring software can operate remotely for long periods without the need for expensive site visits. 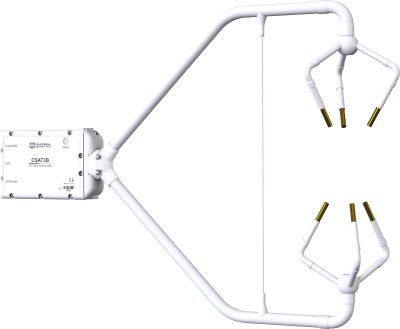 The water flux systems offered by Campbell Scientific measure the water exchange between the biosphere and atmosphere using the eddy-covariance technique. 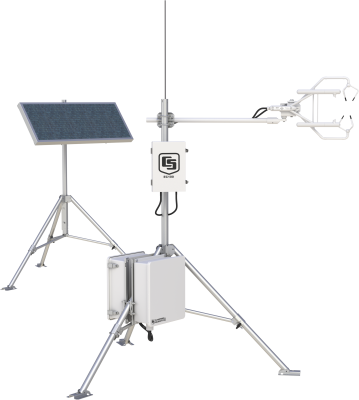 This technique relies on a high-resolution, fast-response 3-D sonic anemometer, as well as a fast-response gas analyzer, data logger, and flux processing program. 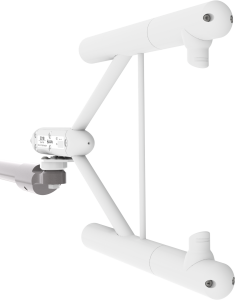 A 3-D sonic anemometer (such as Campbell Scientific’s CSAT3B, CSAT3A, or IRGASON®) measures three orthogonal wind components and the speed of sound by determining the time of flight of sound between three pairs of transducers. In a water flux system, the turbulent fluctuations of vertical wind measured by the 3-D sonic anemometer are used in conjunction with an infrared gas analyzer to estimate the magnitude and direction of H2O exchange. This instrument must have adequate frequency response to capture small eddies in the atmosphere. All of Campbell Scientific’s sonic anemometers have adequate frequency response to be used in water flux systems. A gas analyzer in a water flux system measures the scalar component of the flux. Campbell Scientific’s gas analyzers for measuring H2O exchange (IRGASON®, EC150 and EC155) are non-dispersive mid-infrared (NDIR) absorption analyzers. A source of infrared radiation is passed along an optical path to a detector. Interference filters are used to filter light wavelengths that correspond to H2O absorption and H2O transmittance. Thus, the dual wavelength nature of the analyzers provides both a reference and sample reading without the need for a separate reference cell and detector. Gas analyzers used for measuring water flux with the eddy-covariance method must be aerodynamic and sample fast enough to resolve small eddies. Gas analyzers must also be able to respond rapidly to small eddies in the atmosphere. The IRGASON®, EC150 and EC155 all have adequate frequency response to be used in water flux systems. In almost all applications, Campbell Scientific water flux systems operate in conjunction with a data logger (that is, the CR3000, CR6, CR1000, or CR1000X). For the closed-path water flux systems, in addition to those functions listed above, the data logger also provides the control for the pump flow and valve switching (for zero/span calibration). 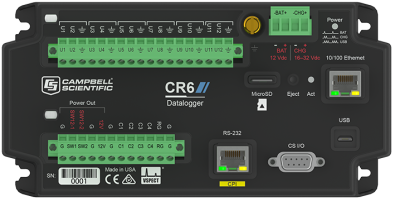 The data loggers used with Campbell Scientific water flux systems require a program for data storage and system operation. For the open- and closed-path water flux system, this program is provided as part of our EasyFlux™ DL offering. EasyFLux™ DL is a CRBasic program that enables the data logger to report fully corrected water fluxes processed from raw high frequency time series data by applying commonly used corrections found in scientific literature. Additionally, this program stores diagnostic and calibration information. Water flux systems are often equipped with additional sensors to measure the surface energy balance. The surface energy balance consists of the net radiation (Rn), soil heat flux (G), latent heat flux (LE), and sensible heat flux (H). 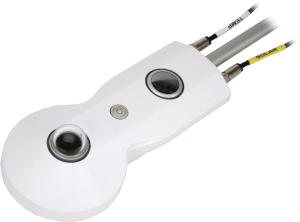 A CNR4-L, NR01-L, or NR-LITE2-L (from Campbell Scientific) is used to measure the net radiation. In a Campbell Scientific water flux system, HFP01-L or HFP01SC-L heat flux plates are used with CS616 or CS65(x) water content reflectometers and TCAV-L averaging thermocouples to calculate the ground heat flux. The gas analyzer and sonic anemometer provide water flux measurements for the latent and sensible heat flux. When an examination of the surface energy balance is performed, it checks for a conservation of energy and can provide estimates of flux reliability or bias in the measurements. In conjunction with the surface energy balance sensors discussed in the previous section, additional biometeorology sensors are often used with the water flux system. In a Campbell Scientific water flux system, these include temperature and relative humidity probes (such as the HMP155A-L or EE181-L), rain gages (such as the TE525-L), and infrared leaf radiometers (such as the SI-111). Data from these sensors are important for gap filling flux data and for understanding environmental conditions. 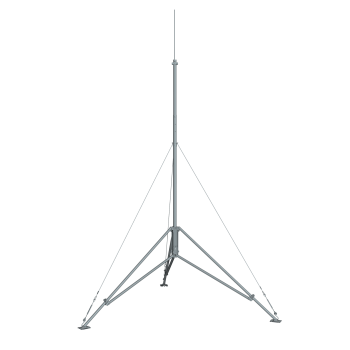 Campbell Scientific offers tripods and towers for mounting water flux systems ranging in height from 2 to 9 m. These offerings include the CM106B, CM110, CM120, UT10, UT20, and UT30. Note: Consideration of the flux footprint must be taken into account when determining the placement of instruments. Cellular, radio, or satellite telemetry can be used for remote communications to water flux systems. This can allow for data monitoring as well as data transfer of fully processed fluxes. Moreover, with the addition of EasyFlux™ Web, it is easier to monitor institution networks of remote water flux systems from anywhere in the world. Campbell Scientific is known for its high-quality data loggers that operate in some of the harshest environmental conditions experienced on earth. These data loggers are at the heart of our water flux systems. Additionally, Campbell Scientific also offers field-rugged, robust analyzers to make water flux measurements. Our low-power H2O analyzers are optimized to be used confidently on remote solar panel systems while keeping biases such as heat generated by the gas analyzer out of the measurement. 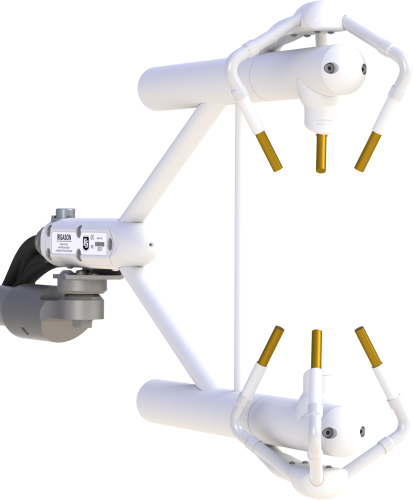 Additionally, our CSAT sonic anemometer is designed with small-diameter transducers at optimized path lengths set at 60 degrees from horizontal to minimize transducer-induced shadowing effects on turbulence measurements. The CSAT also includes an optional correction for instances when wind blows parallel to the transducer path length. The eddy-covariance technique is commonly used for water flux measurements to estimate evapotranspiration. There are, however, two different approaches that may be employed: open path or closed path. The open-path approach to measuring water flux uses gas analyzers that measure the absorption of an infrared beam that is propagated through the atmosphere from a source to a detector. These systems measure both temperature and pressure in the path that the gas measurement is made, eliminating the need to correct for density effects on the water flux measurement. Open-path systems do not use a pump, so the power requirement is less. Open-path systems typically do not have temperature and pressure measurements in the measurement path. Therefore, they require corrections for density effects on the flux (Webb Perman Luening correction). Measurement instruments used in water flux systems may or may not have integrated sensors to make colocated measurements. A truly colocated design avoids flux loss due to spatial separation, which becomes more important the closer to the surface the instrument is located. In addition, a colocated design provides a sonic temperature in the path of the gas measurement, allowing for a flux to be calculated based on a point-by-point mixing ratio. An instrument with a fixed separation between the sonic anemometer and the gas analyzer minimizes wind flow distortion effects caused by the analyzer housing at large angles of attack. An instrument with this type of spatial separation, however, requires a correction factor to account for the flux loss, as well as a density correction on fluxes because there is no longer a sonic temperature measurement in the gas measurement path. Selecting a water flux system is an important decision that requires careful consideration. For assistance with the selection process, review the detailed Purchase Considerations section. To assess the various water flux systems available to you and ultimately determine which system is the most suitable, you should first identify your application's needs and requirements. If necessary, review any related documentation, permits, or regulations. Your familiarity with these items will help ensure that the system you select will meet your compliance requirements. Measurement-related priorities can be crucial to selecting the appropriate equipment. If ease-of-use is one of the most important requirements of your water flux system, open-path instruments may be a better choice. For water flux measurements, Campbell Scientific offers open-path sensors, such as the IRGASON® (Integrated CO2 and H2O Open-Path Gas Analyzer and 3-D Sonic Anemometer) or the EC150 (CO2/H2O Open-Path Gas Analyzer) with the CSAT3A (3-D Sonic Anemometer). 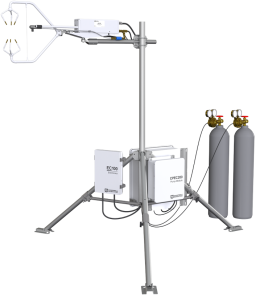 For water flux measurements requiring a separate gas analyzer and sonic anemometer, Campbell Scientific offers the CSAT3A 3-D Sonic Anemometer and the EC150 CO2/H2O Open-Path Gas Analyzer. If the site for your water flux system is remote and not easily accessed, you will need to select components that match well with your intended frequency of site visits. To provide continuous monitoring, you will need a power supply that is sized to meet the total power requirements of all the components of your water flux system. If your site does not have access to ac power, you may need to use an internal sealed rechargeable battery—in combination with a solar panel. Consider your site's location and if the amount of solar radiation makes using a solar panel a viable option. If your water flux system is located at a site that receives minimal sunlight, ensure that you will have enough power supply for continuous monitoring. The solar panel must be able to supply enough wattage to recharge the battery, as well as maintain system power, even during periods of low solar radiation. As with any high-performance equipment, some level of maintenance (cleaning, calibration, and replacement) of the various water flux components is routinely required. Review the recommended calibration and maintenance frequency of your system components so you can create a maintenance budget in terms of employee resources, travel time for site visits, and equipment costs. Determine which maintenance tasks can be handled onsite, such as with a field calibration tool, and which require equipment to be sent to the manufacturer. If downtime without data is not acceptable, have sufficient replacement parts (such as batteries) and backup equipment on hand.